We’re pretty tickled about this! 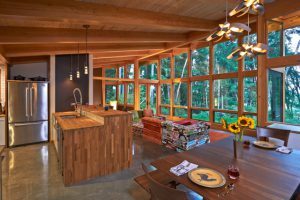 The Sunday Seattle Times published a four-page article in Pacific NW Magazine about one of our TimberCab homes on Vashon Island. This custom designed home includes a bump-out screened porch with a fireplace and our marquee wall of windows. The family — which happens to include a zoologist — spends time hanging out, taking in the natural views and watching the island wildlife wander by. The floors are polished concrete floors with radiant heat and controls that can be managed from anywhere on an iPhone. The structural insulated panels (SIPs), together with the energy-efficient windows, earned the home three stars from Built Green, an environmental building program of the Master Builders Association of King and Snohomish counties.